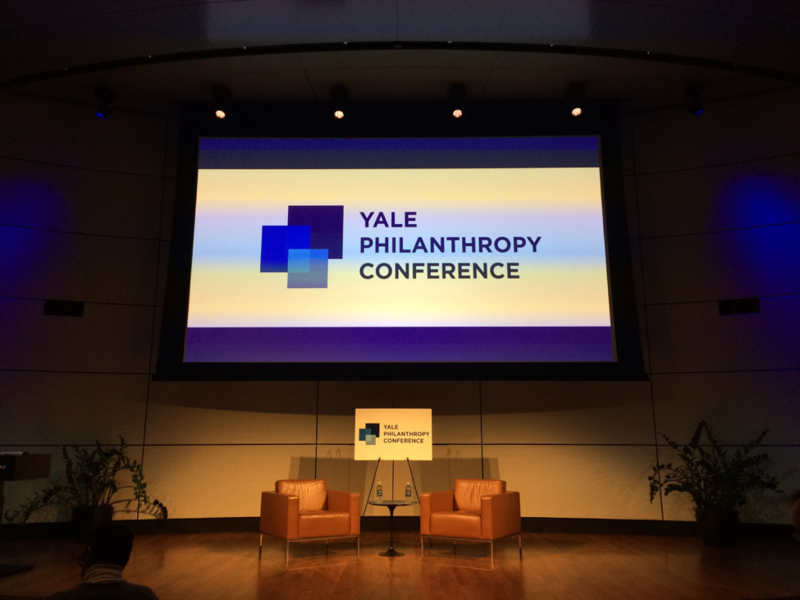 Hana ElSafoury ’19 traveled to New Haven, CT to attend the Yale Philanthropy Conference. You can read Hana’s reflection below, read other conference reflections here, and visit the PCSE website to learn more about all of our grant programs. On Friday, February 22nd, I attended the 2019 Yale Philanthropy Conference. This is a yearly conference that gathers professionals in the philanthropic sector to discuss and reflect on the field and think critically about their place in it. This year, there was a clear theme of centering impact and trust of grantees who are using the money. I was the only undergraduate amongst the several hundred attendees but felt included thanks to the efforts of some amazing leaders in the field who took me under their wing and shared their experiences with me. Besides the relationships I built and the mentors I gained, I learned a lot! The conference was a full day event that started at 9:00 with a keynote speech by Anne Marie Burgoyne, the Managing Director, Social Innovation at the Emerson Collective. She began with the question, “how do we flatten the power dynamics in philanthropy and be in conversation with the people we claim to serve?” Right off the bat, she grabbed my attention. The Emerson Collective is a grant-giving entity that supports ventures that disrupt systems as well as general support grants with a minimum of 2-year support. They have a very risk-tolerant model and so they fund projects that might be in their early phases or completely new and untested. What makes the Collective unique is their conviction that they do not hold all the answers. They understand the limitations in their work, so they always stress dialogue. Burgoyne mentioned how at the beginning of every new relationship with a grantee she asks, “what can I do to help you” and “what can I learn from you?” The Emerson Collective is only a few years old and so it was great to witness first hand how they have constructed their identity and continue to tweak their methods of giving. 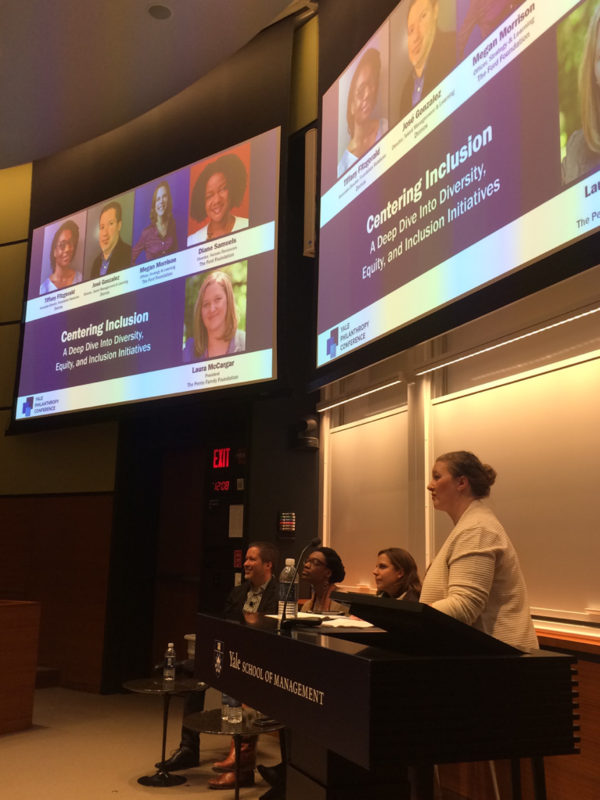 Laura McCargar, President of the Perrin Foundation and JCCP Mentor in Residence, was one of the speakers for the Centering Inclusion Session. After the speech, I had a choice to go to one of three workshops offered “Beyond the Bottom Line: When Good for Business and Good for the World Collide” , “Building On Trust: Redesigning Funding Models and Funder-Grantee Relationships”, “Centering Inclusion: A Deep Dive into Diversity Equity and Inclusion Initiatives.” I chose to attend the DEI workshop. 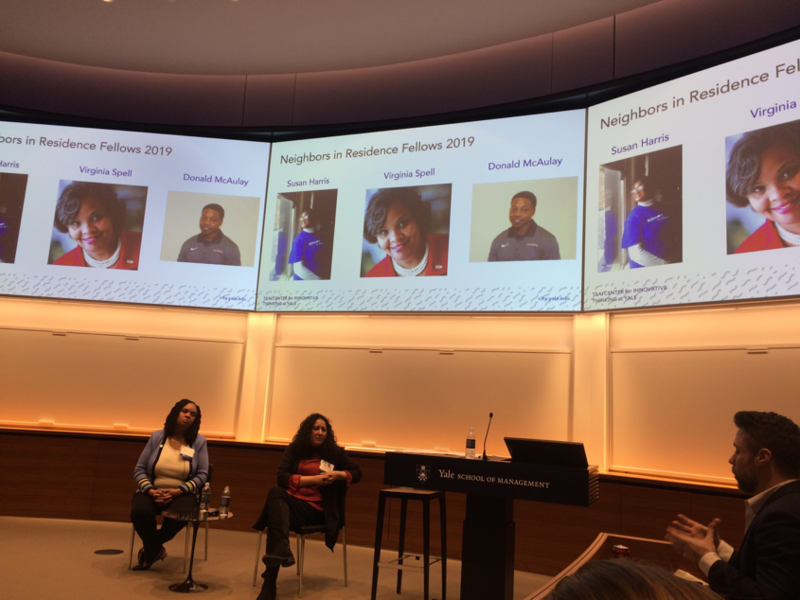 The panel had representatives from the Ford Foundation and Demos, two very different organizations. The panel also featured Laura McCargar, President of the Perrin Foundation and JCCP Mentor in Residence. I learned a lot from this workshop. My favorite two lines from the whole conference came from this workshop. *Diversity is the count of who is in the room, Equity is who counts, Inclusion is whose ideas and suggestions count. One of the main points of the workshop was that diversity is actually not what is most important, equity and inclusion are. DEI efforts are not about representations but rather support. The key to DEI efforts is the constant reflection on the limitations of one’s positionality and active steps to fill the blind spots with eyes that know what to look for. The session ended with a question on disability and how different cultures require a specific definition of diversity. Right after this workshop, there was a lecture by Baljeet Sandu on the value of lived experiences. Baljeet was an amazing speaker and she spoke very candidly about the hypocrisy of the philanthropic field that claims to fight for the grassroots and social justice movements without the inclusion of people within those categories. She argued that none of the work of progressive philanthropy will matter unless we take active steps to include those on the front lines. Lived experiences have been validated historically because they were deemed “too emotional.” A person with a lived experience is too “in it” to be able to step back and think of viable solutions. Baljeet deconstructed that argument and stressed that those who are “in it” are the ones who have been trying to dismantle the problems from day 1. The people philanthropy financially support are not stagnant stories of need but ones of agency and leadership. They are entrepreneurs. Their lived experiences have become lived expertise that needs to be supported and utilized. I then attended two more sessions, a workshop titled “New Vehicles for Change: How Individuals Embody their Values Through Giving” and a Keynote Speech by Sherry Salway Black about philanthropy on Native Lands. I ended the conference with more questions about this field and the way in which pushing against its racist and classist history takes various forms. There is no doubt philanthropy is important but it can also be a mask of neutrality that is put on relationships of power that are inequitable. The conference succeeded in removing the veil and showing how messy this sector is. It succeeded in juxtaposing philanthropy’s many problems against its immense impact, and that was a great conversation to be a part of. I cannot wait to see where all this information will lead me!